Wow, It’s been almost a year since I posted anything in this blog. But anyway I am taking the Master Recycler class at Oregon State University. And our first assignment was to do a household waste audit. It’s a messy job, but highly educational. We were supposed to weigh everything, but my household scale is so insensitive that I couldn’t tell any difference when I was holding the trash can or not. So you’ll just have to settle for pictures. I’m going to go through these in reverse order and talk about how each is handled on the front (our) end, with pictures. It is currently January, and our backyard is mostly under water. We are not doing much outdoor yard maintenence at this time. So for this particular audit, our contribution in this category is zero. Allied Waste Services provides this large bin (pictured below) for collecting this material to be sent to the Paific Region Compost Center. They will collect it any collection day that we put it out. I do not currently add any food waste to this (Food waste in the commercial compost has only been permitted in our vicinity for a few months). 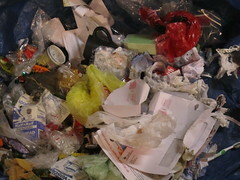 The main reason is that most of the food related waste we generate is vegetarian, and can go in the personal compost. I intend to designate a container for this material and keep it in the freezer. Meat scraps, bones, fruit stones, and any other material that does not break down well in our personal compost will go here. When the receptacle is filled AND it’s trash day, I will add it to our bin. I don’t feel comfortable potentially having meat scraps sitting around outdoors in our warmish Oregon winters for weeks and weeks. 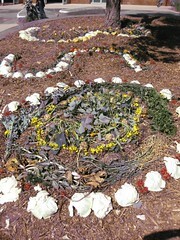 We have been doing personal composting for over 20 years. We are not very scientific about it. We have three compost areas. The black bin is allowed to have dog poop, and compost from this one never goes into the garden where we grow edibles. The “death star” compost rolling ball is supposed to be mixable by simply rolling on the casters, but in practice that doesn’t happen because it gets too heavy and simply can’t be rolled. In warm weather it does, however, compost quite quickly. The fenced bin exists because sometimes there is more material than the death star can hold. We just throw everything in the piles and at some point we start a new pile, let the old one rest, then work it into the garden. As a result of this, our garden is full of peach and other fruit pits. I don’t think they hurt anything, but I throw them out in the walkway between the garden beds as I find them when I’m weeding. We have used this cute little ceramic yuppie compost bucket for the past 8 years. A throwaway large yogurt bucket with a lid works fine too but it’s not as classy looking. The yuppie bucket came with some little odor filters but I find they are not really necessary. We take the compost bucket out approximately every other day. The bucket is approximately a gallon, so I estimate that we generate about three gallons of food waste per week. This is NOT post-serving wasted food. It is mostly preparation-generated, and includes cores, peelings, husks, seeds, bad bits, and other inedible parts of fruits and vegetables. 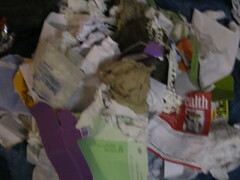 I did not audit the conmingled bin, as it is fairly constant from week to week. 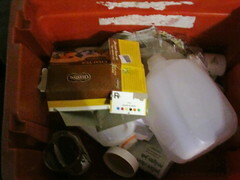 We collect the recyclables in this red bin, and then throw them into the tan bin provided by AWS for collection day. We rarely fill the tan bin, and could probably have it picked up once a month, as we do not toss anything excessively dirty in this bin. 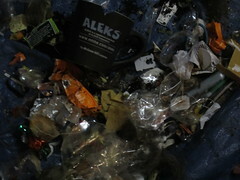 Non deposit cans and plastics get rinsed before going in the bin. (Household rule.) The red bin typically contains a week’s worth of newspapers, cardboard, corrugated cardboard, and junk mail, probably a half a dozen cans, and low quality plastic bottles and other plastic containers that we can’t or choose not to reuse. We can’t reuse ’em all!! I would just as soon not get the newspaper, but that idea does not fly in our family. We have taken steps to reduce junk mail, but we haven’t done everything possible. We subscribe to very very few paper magazines. The grey bin is for glass, as AWS requires this to be segregated. Luckily we don’t have to worry about the color any more. 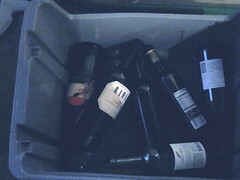 This bin typically receives 6-12 glass bottles and jars in a week. AWS is supposed to pick this up once a month but we often forget it, and sometimes they do too. We manually take glass to AWS ourselves when a bunch has accumulated and we’re sick of looking at it. AWS finds some uses for glass but it turns out that it does not really get melted down and turned into new glass, as it would in an ideal world. The yellow bin is for deposit items. We are not big consumers of soda or commercial beer. We brew some of our own beer and we use recycled bottles. This particular week the yellow bin had nothing. 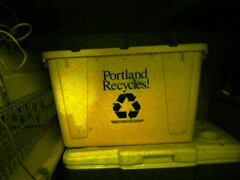 When this bin fills up, we take it to Fred Meyer for store credit. If we don’t have time to do this, we leave it out for the guys who make their living collecting deposit items. AWS knows about this and leaves the bin alone for them. Anything that does not fit the above five categories goes into this category. I am so proud that only a small kitchen rubbish bin of this type of material was generated by our household in this week. Paper that did not get Recycled. 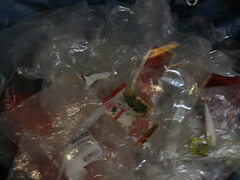 Although there wasn’t really much of this, ideally we should recycle all recyclable paper. Plastic bags, plastic wrap etc. We could reduce this component if we reduced our purchase of package and convenience food. 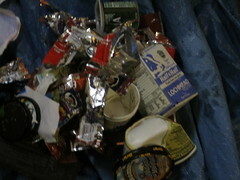 Food wrappers and contaminated cardboard containers. We could reduce this component if we reduced our purchase of package and convenience food. I have also learned that pizza boxes, ice cream cardboard containers, etc. can go into the yard waste bin. In an ideal world, our weekly discard would be reduced to just about this much stuff. See Bram Pitoyo’s Mushroom risotto on Key Ingredient. Tasty tasty rice dish. I guess I would call it Asian-Italian fusion style cooking. All my other risottos are more Italian in spices. Anyway Bram was kind enough to tweet this recipe to me on twitter so there you go.